This article is accredited for one SA-CME credit. Visit appliedradiology.org/SAM for full SA-CME information. However, most patients who undergo CTA will not be found to have PE, which has an approximately 10% positivity rate in the United States.4-5 This article will review the variety of abnormalities that can be seen in patients who are undergoing evaluation for the possibility of PE when there is no evidence of PE. Although clinical decision tools have been developed to determine the pretest probability of PE in any given patient, incomplete adherence or nonadherence to these criteria may occur. Even when the guidelines are followed, most studies will be negative for PE. Therefore, radiologists must diligently search for alternative diagnoses that might otherwise explain the patient’s symptoms. This allows for prompt treatment and increases the physician’s certainty that the patient can be safely discharged. Pneumonia was the most common alternative diagnosis to PE in several studies that reviewed additional findings in patients without PE (Figure 1).4-12 Patients with pneumonia typically present with fever and a productive cough. 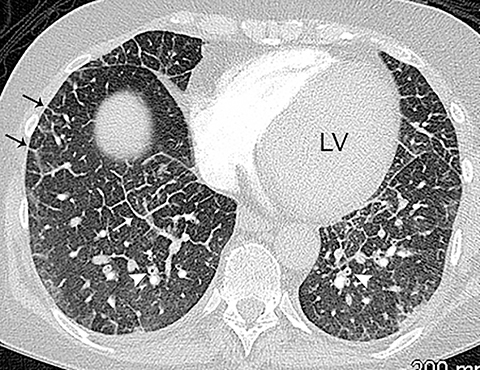 Consolidation that abuts the pleural surface, a common feature of lobar pneumonia, may cause chest pain. Although pneumonia is commonly diagnosed by chest radiography, if the involved area of lung is small, it may not be detected. In addition, pneumonia may not be detected if the patient has had a portable chest radiograph, rather than a PA and lateral, in which case the area of involved lung may not be appreciated. 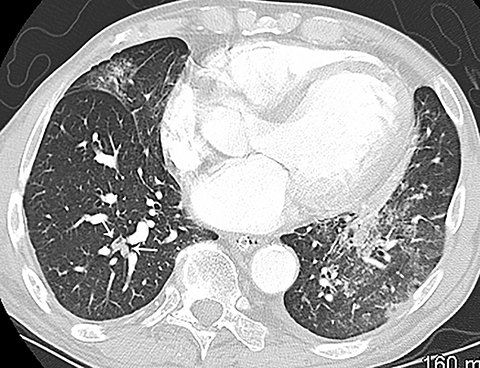 Hypoinflation of the lung, in a patient who is unable to take a deep breath because of chest pain, as well as obesity can also be limiting factors for the diagnostic efficacy of radiographs. If there is a focal area of consolidation at the lung base that abuts the pleura, including the possibility of a lung infarct as well as pneumonia in the differential diagnosis is reasonable. 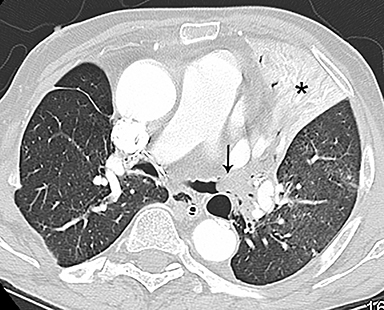 On CT, pneumonia has the appearance of airspace disease manifesting as areas of consolidation with air bronchograms, ill-defined centrilobular nodules and adjacent ground-glass opacities. Larger areas of consolidation are more likely to be appreciated on chest radiographs. However, early in the disease process, ill-defined, centrilobular nodules may not be appreciated on radiographs. In addition, the tree-in-bud pattern, which can be seen in patients with bacterial, mycobacterial, fungal or viral infection, may not be visible on the chest radiograph. Patients with acute or chronic bronchitis may develop mucus plugging or occlusion of bronchi due to infected secretions, which can cause dyspnea, particularly in patients with poor pulmonary reserve (Figure 2). Low-attenuation secretions within the bronchi can also be misinterpreted as pulmonary emboli on CTA when viewing images with mediastinal windows. Pleural effusion has a variety of causes and can cause chest pain and shortness of breath if the volume of fluid is large (Figure 3). Pleural effusion is identified on chest radiography when it causes blunting of the normally sharp costophrenic angle. Patients with pneumothorax can also present with chest pain and acute shortness of breath. 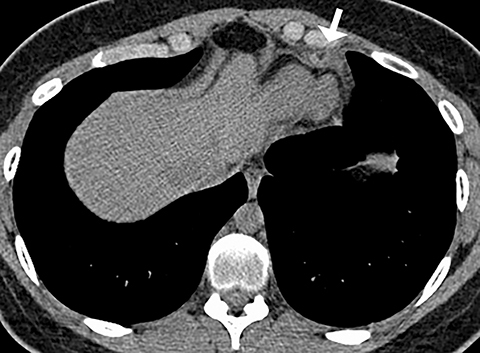 Primary spontaneous pneumothorax typically occurs in relatively younger patients and is easily detected by chest radiography. However, if the patient is not upright, smaller pleural air collections may not be appreciated. In addition, fluid overload can occur in the peripartum period. Patients who receive tocolytics are also more prone to develop pulmonary edema. In a study of 92 patients with pre-eclampsia, risk factors for patients who developed pulmonary edema included both nulliparity and the administration of magnesium sulphate.16 Note that in this study, half of the patients developed pulmonary edema prior to delivery, and half developed pulmonary edema in the postpartum period. Pulmonary edema can also occur in nonpregnant patients in the setting of over hydration and in patients with renal failure. 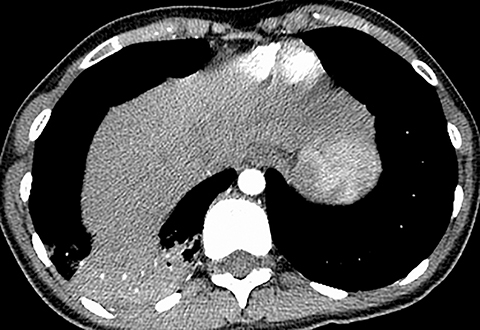 Patients with acute aortic pathology, including aortic dissection or rupture, may have a presentation that causes the referring physician to consider PE as the primary differential diagnosis. Because CTA protocols and patient physiology, respectively differ, opacification of the aorta may or may not be adequate to evaluate for dissection. Even if opacification of the aortic lumen is suboptimal, the presence of displaced intimal calcification indicates the presence of an aortic dissection. 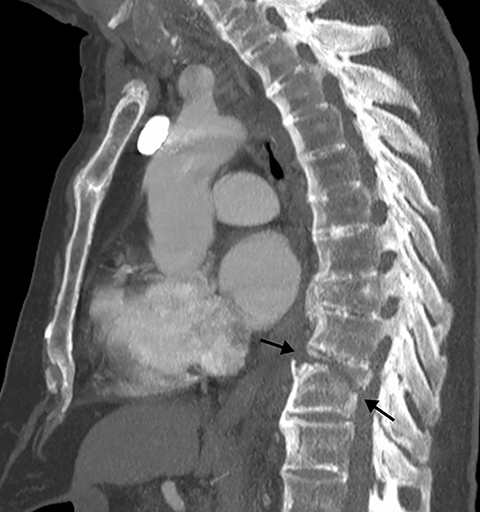 An abnormal contour of the outer aortic wall, thrombus and extravasated contrast-enhanced blood can be seen in the setting of contained aortic rupture (Figure 5). Patients with pericarditis classically present with chest pain that increases with deep inspiration, which can mimic the symptoms of pulmonary embolism. Most cases of pericarditis are due either to a viral infection or are idiopathic and the diagnosis may be difficult to establish clinically if the characteristic physical exam finding of a pericardial rub is not appreciated. 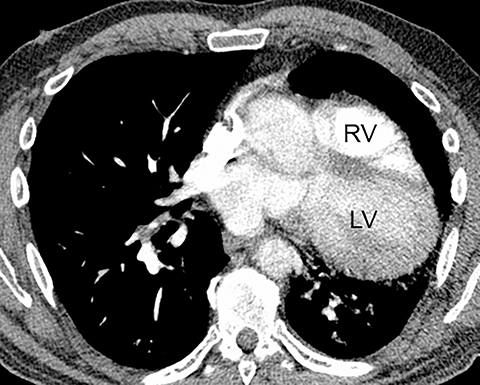 On CT, patients with pericarditis will usually have a varying amount of pericardial fluid as well as thickening and enhancement of the visceral and parietal pericardium (Figure 6). Pericardial irritation due to hemopericardium can also occur in patients with perforation of a pacemaker lead or in postsurgical patients. Such patients will have similar symptoms of chest pain with or without the presence of a pericardial rub. Although an unusual cause of nonspecific chest pain, patients with congenital pericardial defects may be evaluated for the possibility of PE. In the setting of complete absence of the left pericardium, the sternopericardial ligament will be absent, allowing the heart to be displaced dependently. The apex of the heart will also characteristically extend to the left lateral chest wall. Additional findings of congenital pericardial absence include the interposition of lung between the ascending aorta and main pulmonary artery due to the lack of the superior aortic pericardial recess (Figure 7). 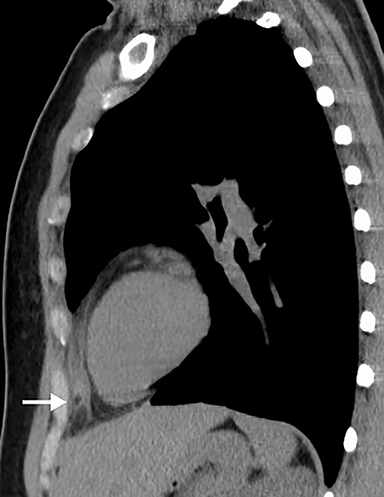 Mediastinal fat adjacent to the pericardium may undergo necrosis, causing chest pain. 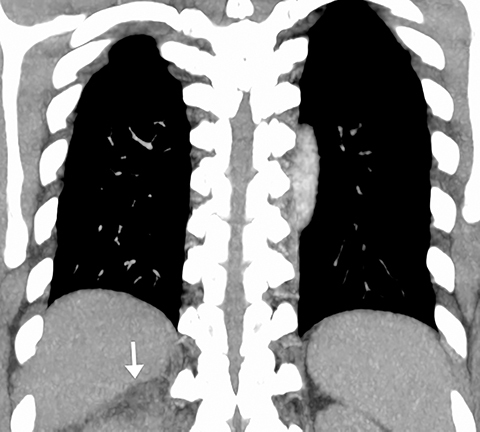 The CT features of mediastinal fat necrosis are similar to the findings of fat necrosis in the abdomen, shown as an area of fat stranding and infiltration with or without an area of central fat lucency (Figure 8). Although post-traumatic rib, spine and sternal fractures are often clinically suspected based on the mechanism and force of injury with potential point-tenderness on physical exam, in the setting of osteopenia, even potentially overlooked minor trauma can result in a fracture (Figure 9). Rib fractures may be radiographically occult, which is less problematic when there is a clear-cut history of trauma since rib fractures are treated conservatively in the absence of pneumo- or hemothorax.17When there is no clear history of trauma, pain associated with fracture may be misinterpreted as pleuritic chest pain due to PE. Finding an area of cortical disruption establishes the presence of a fracture, although if the fracture is not displaced, especially in the setting of osteopenia, it may be difficult to identify---even on CT. This is compounded by the fact that the exact location of the patient’s pain is often not available to the radiologist. Sagittal two-dimensional (2D) reformats are particularly useful for the detection of sternal and vertebral fractures. Review of axial images and sagittal and coronal 2D reformats may be necessary to identify subtle rib fractures. 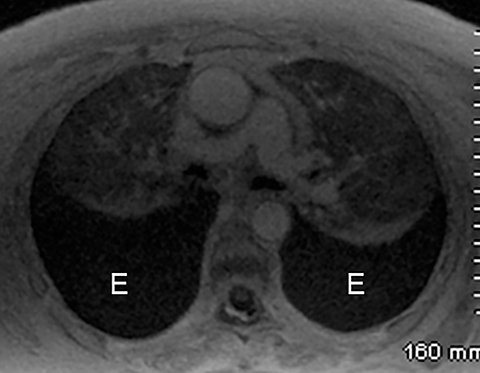 The presence of focal pleural thickening due to a subpleural hematoma can help focus attention on the underlying rib. Bony metastases may also cause pain. Close review of the bony structures including 2D reformats is recommended, specifically in patients with a history of malignancy (Figure 10). 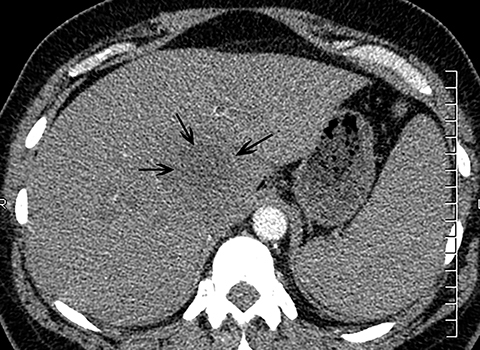 Intra-abdominal pathology can cause symptoms that seem to be related to intrathoracic pathology, such as a PE. For example, disease processes that occur close to the diaphragm can cause symptoms that are located in both the lower chest and the upper abdomen. 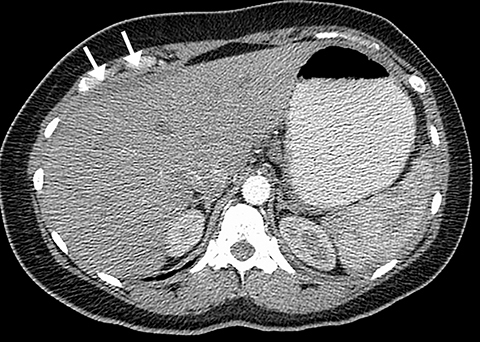 Such disease processes include splenic (Figure 11) or renal infarcts, pyelonephritis (Figure 12), sub-diaphragmatic or hepatic abscess (Figure 13) and pancreatitis. 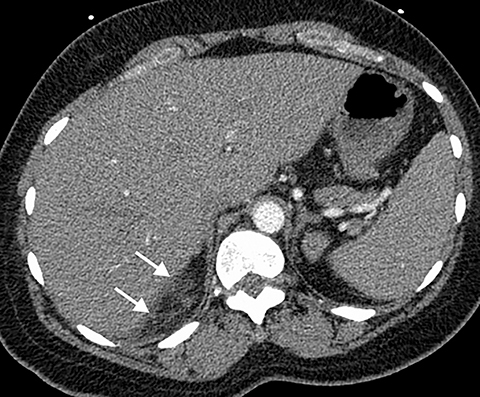 Although CTA exams are limited to the thorax, the included abdominal structures should be scrutinized for pathology as the cause of the patient’s symptoms, particularly when there is no evidence of PE or other intrathoracic pathology. Hemoperitoneum from any cause can result in diaphragmatic irritation (Figure 14). Therefore, it is important to measure the density of any intra-abdominal fluid since the perception of high-attenuation hemoperitoneum may not be appreciated on a contrast-enhanced scan. Patients undergoing CTA for the evaluation of a possible PE present with a variety of symptoms and coexisting pathology. 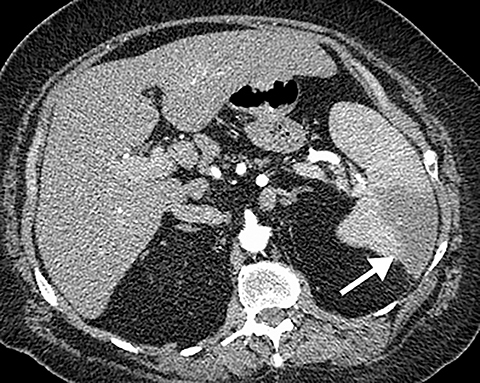 Since most patients who undergo CTA do not have a PE, a full understanding of the wide variety of pathology that may be present will allow the radiologist to adequately search for and recognize alternative diagnoses. 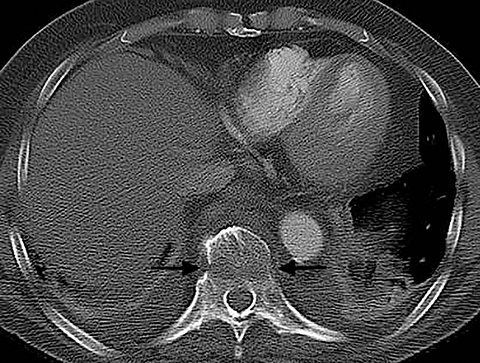 Goldhaber SZ, Bounameaux H. Pulmonary embolism and deep vein thrombosis. Lancet. 2012; 379(9828):1835-1846. Beckman MG, Hooper WC, Critchley SE, et al. Venous thromboembolism: a public health concern. Am J Prev Med. 2010; 38(4S):S495-S501. Stein PD, Fowler SE, Goodman LR, et al. Multidetector computed tomography for acute pulmonary embolism. N Engl J Med. 2006; 354(22):2317-2327. Perelas A, Dimou A, Saenz A, et al. 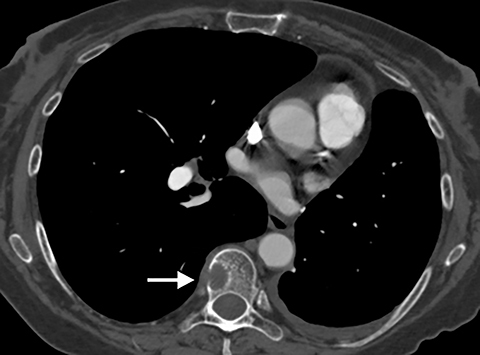 Incidental findings on computed tomography angiography in patients evaluated for pulmonary embolism. Ann Am Thorac Soc. 2015; 12(5):689-695. Richman PB, Courtney DM, Friese J, et al. Prevalence and significance of nonthromboembolic findings on chest computed tomography angiography performed to rule out pulmonary embolism: a multicenter study of 1,025 emergency department patients. Acad Emerg Med. 2004; 11(6):642-647. Ferreira EV, Gazzana MB, Sarmento MB, et al. 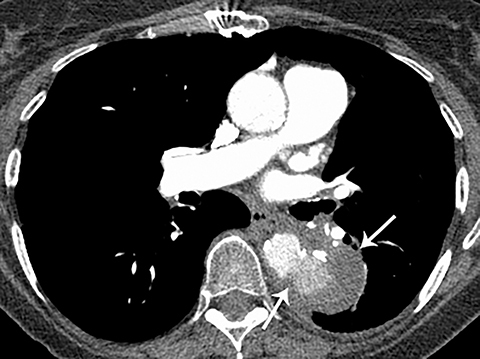 Alternative diagnoses based on CT angiography of the chest in patients with suspected pulmonary thromboembolism. J Bras Pneumol. 2016; 42(1):35-41.
van Es J, Douma RA, Schreuder SM, et al. Clinical impact of findings supporting an alternative diagnosis on CT pulmonary angiography in patients with suspected pulmonary embolism. Chest. 2913; 144(6):1893-1899. Stein PD, Matta F, Sedrick JA, et al. 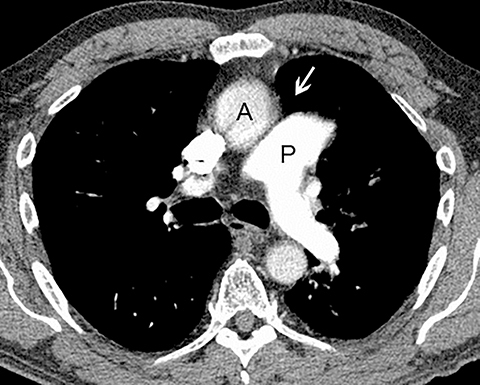 Ancillary findings on CT pulmonary angiograms and abnormalities on chest radiographs in patients in whom pulmonary embolism was excluded. Clin Appl Thromb Hemost. 2012; 18(2):201-205. Moriarty JM, Bolster F, O’Connor C, et al. Frequency of nonthromboembolic imaging abnormalities in pregnant women referred for computed tomography pulmonary arteriography. Can Assoc Radiol J. 2015; 66(1):24-29. Green DB, Raptis CA, Huete Garin IA, et al. 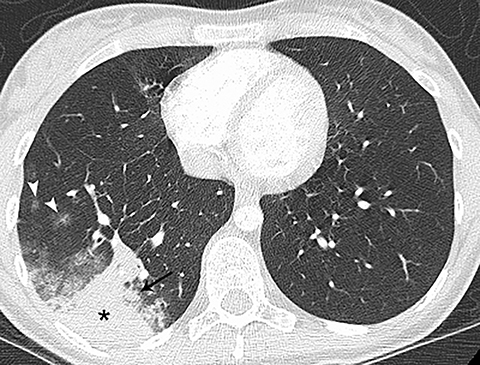 Negative computed tomography for acute pulmonary embolism: important differential diagnostic considerations for acute dyspnea. Radiol Clin N Am. 2015; 53(4):789-799.
van Strijen MJL, Bloem JL, de Monyé W, et al. Helical computed tomography and alternative diagnosis in patients with excluded pulmonary embolism. J Thromb Haemost. 2005; 3(11):2449-2256. Schiebler ML, Ahuja J, Repplinger MD, et al. Incidence of actionable findings on contrast enhanced magnetic resonance angiography ordered for pulmonary embolism evaluation. Eur J Radiol. 2016; 85(8):1383-1389. Gosalia A, Haramati LB, Sheth MP, et al. 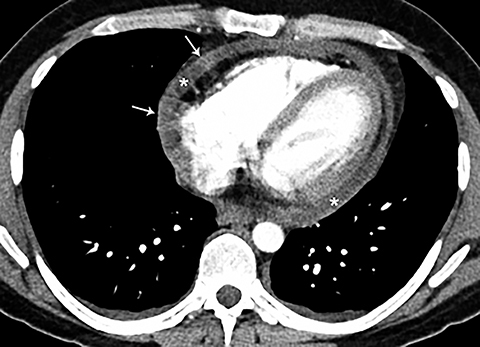 CT detection of acute myocardial infarction. Am J Roentgenol. 2004; 182(6):1563-1566. Mano Y, Anzai T, Yoshizawa A, et al. Role of non-electrocardiogram-gated contrast-enhanced computed tomography in the diagnosis of acute coronary syndrome. Heart Vessels. 2015; 30(1):1-8. Himoto Y, Kido A, Moribata Y, et al. CT and MR imaging findings of systemic complications occurring during pregnancy and puerperal period, adversely affected by natural changes. Eur J Radiol Open. 2015; 2:101-110. Gandhi S, Sun D, Park AL, et al. The pulmonary edema preeclampsia evaluation (PEPE) study. J Obstet Gynaecol Can. 2014; 36(12):1065-1070. Henry TS, Kirsch J, Kanne JP, et al. ACR Appropriateness Criteria® rib fractures. J Thorac Imaging. 2014;29(6):364-366. Capel KW, Broderick LS. PE or no PE? Alternative diagnoses on CTA. Appl Radiol. 2018;47(3):8-13. Dr. Capel is a Radiologist at University Hospital, Madison, WI, and is a Chief Radiology Resident in the Department of Radiology, University of Wisconsin-Madison, Madison, WI. Dr. Broderick is a Professor in the Department of Radiology, University of Wisconsin-Madison, Madison, WI. The authors declare that they have no conflicts of interest.